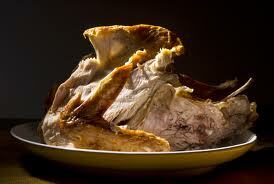 Well, another Thanksgiving has been here and gone. Like the previous years, this year – as God-fearing white Americans – we once again upheld our annual tradition of giving out small pox blankets to the local Native Americans and kicking them out of their houses, claiming our right to do so, followed up with some puppy-kicking to work off all of that food we choked down in front of all the starving homeless. ‘Merica. I kid, I kid. Though, it just doesn’t seem like a true Holiday experience without someone posting a guilt trip-ridden rant against Thanksgiving upon Facebook (my social media of choice at the moment). In all caps, usually. Here we are, fully ensconced within this year’s Holiday Cluster Bomb (the last word there usually consists of another four-letter word, but in the interest of keeping things civil, I choose to refrain from using it…though, at times it would be the perfect label, to be sure): The opening ceremony of Halloween a fading memory, Thanksgiving out of the way, and the so-called Black Friday having just slipped into Buyer’s Remorse Saturday (TM), the big one of the Holiday Tripod will soon be upon us- Christmas. Between then and now, we can all look forward to retail headaches, stress-enducing family gatherings, and gallons upon gallons of Holiday Cheer being force-fed to all of our senses. Decorations, television specials, and Christmas music everywhere you turn. Bell ringers keeping an upbeat demeanor as they shiver in the cold amidst be-haggard shoppers. The delicate sound of children screaming in the toy aisle. If it sounds like I’m a bitter, jaded curmudgeon about the Holiday season, well…I’m not, really. Truth is, amidst all of the hoopla that will stretch until New Years Day (and a bit beyond, depending on the level of hangover some will experience), I can step back and observe things in a fairly detached manner, and have a sense of humor about all of this. With a twinkle in my eye and a smirk on my lips, my going through this Holiday season will be the same as how I get through any day of the year. Though, admittedly, things are a bit different now than they have been in years previous. And that’s a good thing, really. Cryptic enough for you? Well, this is what happens when I freestyle a blog post like this, without any kind of structure whipped up before hand. No point, just pure unadulterated brain droppings at this late/early hour here in Eastern Nebraska. ‘Tis how I roll at times, yea verily. Cheers. In this horror flick, the stars of a paranormal investigation TV show spend the night in a derelict psychiatric hospital, hoping to uncover what’s been going bump in the night. As their cameras roll, they find themselves trapped — and hunted. Well well well, lookie what we have here. Could it be…no, it can’t. But wait…yes. Yes I do believe we have a found footage-style horror movie that actually worked with your old, jaded Uncle NecRo. Mind you, I went into Grave Encounters after having watched the less-than-stellar Episode 50. So, I wasn’t really expecting much when I pressed Play on the second choice to round out a theme night of horror movie watchin’. And man, what a pleasant surprise Grave Encounters was. Sure, it’s yet another Found Footage movie with a Mocumentary style, set at another abandoned mental asylum with a nefarious history. Usually, the general script for one of these goes like this: Hapless amateur paranormal investigators spend the night in abandoned building, wackiness ensues, and either they all die/disappear/something really bad happens, or some of them, or none of them, by the time the sun rises. End of movie. 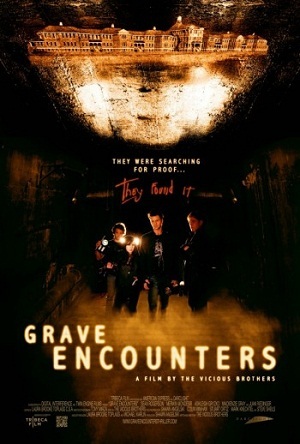 No, with Grave Encounters, things start off that way – the raw footage shows the group getting outside shots and local interviews, even showing some goof footage to show that the investigators or a bit less than altruistic. But, once the caretaker of this building chains things up, and after the usual spookiness happens, things take a turn for the weird. Yep, this oft-used trope is given quite the big, healthy twist, to liven things up a bit and give us something different in the mix. And no, I’m not going to tell you what that is. The acting from the cast was top-notch, everyone doing a great job with their roles. The effects were done mostly in the dark shadows, and with really great effect. Those of you who thought the effects used in the Paranormal Activity movies were kinda cool but lame overall might want to give Grave Encounters a shot. Mind you, things did start to drag in the last fifteen minutes or so, but overall Grave Encounters was a surprisingly enjoyable 90 minutes of paranormal-style horror goodness. Recommended. A year after a film crew spent a fatal night there, a new team is entering the halls of Collingwood Psychiatric Hospital in search of the truth. What they discover will make believers out of all of them. That is, any who live to tell the tale. As found footage movies go, I did find the original Grave Encounters to be one of the better examples of the much-exploited horror subgenre. So, when I heard of the sequel being made, I did anticipate its release onto DVD so I could get around to watching to see how well it compared to the first movie. So, does Grave Encounters 2 hold up its own the second time around? For the most part, yes. The story this time centers on a film school student who becomes obsessed with finding out if the movie Grave Encounters was real or not. To that end, he tracks down themoth3er of one of the actors, and the producer who released the first film. Finally, at the invitation of someone called DeathAwaits666 (guessing that’s not their real name, there), he and a few of his film school cohorts head out to the old Asylum to discover the truth. Of course, the beginning of the film reminds one of the second Blair Witch movie, with video reviewers giving their two cents on the original movie. From there, Grave Encounters 2 builds upon the original, and actually delivers a movie that is just as intriguing, if not better than the original. Much unlike the second Blair Witch movie. For the first two thirds of the film, you witness a somewhat jaded film student at first blowing off the first Grave Encounters movie as trite and derivative cheap horror. Then, he gets a bit more obsessed with finding out whether or not the movie was actually true, as the actors featured on there weren’t really heard from again, at least haven’t worked in other films since then. So he sets off to check out the veracity of everything, tracking down the mother of one of the actors, and finally the producer of the flick itself, everyone telling him to let it go, it’s just a movie. Obviously, he doesn’t buy any of it, and talks his friends into heading out to the Asylum where everything was filmed. Then the wackiness truly ensues. What Grave Encounters 2 gets right is building a very thick and palpable sense of dread and uncomfortable atmosphere, managing to set a nice dark tone. Despite starting off with film footage of stupid college kids at a Halloween party (gah), the characters are actually built upon decently, giving a bit of depth on most of them (save for that hop-headed idiot that every movie seems to need to have nowadays…where’s Jason when you need him, eh?) so there’s a little bit of caring when the bad stuff really starts to happen. I was rather amused that the lead character wanted to do something to revolutionize the horror movie genre, and then we see footage of him making the same-old cliché-ridden horror movie as his student film. Don’t want to read too much into this, but…sly commentary, mayhaps? Anyhoo, it’s when they arrive at the asylum when things settles back into the weird stuff that made the first one pretty good. It’s not a complete rehash of the first and all, fortunately, the movie does do some different things with some of the same effects and concepts of the first. However, around the final third of the movie…well, not going to spoil things, but let’s just say it was a decent enough twist, but it did slow things down considerably as far as pacing went. 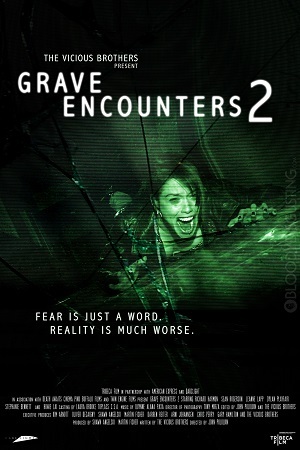 Overall, I found Grave Encounters 2 to be just as entertaining as the first Grave Encounters. The fact that they decided to not go the rehash route that certain other found footage sequels have been doing as of late (*cough*) gets some points right there. It also helps that the script was pretty strong, as were the actors and effects. I don’t know if it’s been released on DVD yet; I watched it on Net Flix streaming, before I could find it for rent at the video store. Regardless, I would urge you guys to watch this as well as the first movie for a nice little party, there. Of the original three …Of The Dead movies that George A. Romero foisted upon the unsuspecting movie public, Dawn Of The Dead resonates the most with this zombie-lovin’ fiend. Being the second movie made featuring the flesh-eating undead ghouls that Nigh Of The Living Dead brought us, Dawn of The Dead expounded on the ultra-bleak situation that humanity has found itself in. On the night when the dead started coming back to life and making a general nuisance of themselves, a couple of television news employees and a couple of police realize humanity’s boned (or de-boned, in this case) and high tail it out of the city, eventually ending up at the mall and shacking up in the zombie-free area, hoping to wait out the undead epidemic without going nuts themselves. Along the way, a thinly veiled commentary on modern consumerism and a biker pie fight led by Tom Savini ensues. You know, I could go on and on about the history of this film, how it came about, the people behind it, it’s place in cinematic horror history, yadda yadda yadda, but in the end what Dawn Of The Dead boils down to is a very striking modern zombie movie classic that delivers a steady stream of uneasy creepiness and a sharp story. I’ll admit, the arrival of the biker gang and its ensuing pie fight seems a bit out of place, but…really, what other movie can you say “zombie and biker gang pie fight” with a straight face? 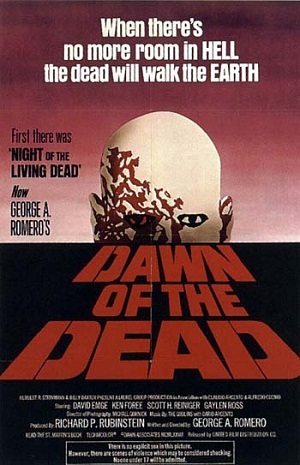 If you’re a zombie movie fan, and haven’t seen the original Dawn Of The Dead…well, I’m ashamed of you. Rectify this now. There are many DVD releases of this out there, but I recommend the Anchor Bay edition, as it has a good commentary by Romero himself in that. Some grind house aficionados become the unwitting stars of an old slasher flick when the film’s crazed killer leaps off the screen to hunt them down, drag them back into the movie and kill them. Well, okay, there’s not much speculation as to the “why”, really. The premise itself wasn’t as tantalizing – masked psychopath kills and terrorizes the theater attendees watching an old horror movie. At least, that’s what I gleaned from the DVD blurb. Standard slasher premise, different setting. Cut-and-paste. Well, fortunately there is a twist to this standard dish. A bizarre supernatural twist that defies all explanation and logic, and tweaks the rules a bit, making Midnight Movie a surprisingly fun ride. For a first time outing, director Jack Messitt has made a rather good impression with Midnight Movie. The story concept was innovative, the characters were a bit more fleshed out than your standard slasher movie fodder, the acting was rather good, and the effects themselves were very cool. The killer’s mask is one of the best designs I’ve seen recently. Also, there’s an angle here that doesn’t even attempt to explain how and why everything is happening the way it is, and that’s just bloody fine by me really. The way it started, I’ll admit, I wasn’t exactly expecting a good outcome for my watching experience, but by the time the credits rolled I was grinning and nodding my head in utter satisfaction. 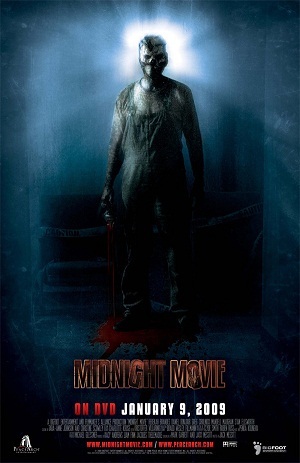 Check out Midnight Movie sometime, turn off the lights and get ready for a bit of old-fashioned slasher horror fun. A young couple find themselves stranded in the rural town of Gatlin, Nebraska, where they encounte3r a mysterious religious sect of children. But nowhere in town are there any adults. The horror grows to a blood-curdling climax as the two new visitors learn the horrifying secret behind the prospering corn fields. I know that I’m going to get some flak for this, but I still remain flabbergasted that the Children Of The Corn managed to not only garner such a fan base, but happened to spawn as many sequels as it did. Well, okay, maybe not as mystified as I should be. But, let’s face it. The original Children Of The Corn was rather mediocre at best. 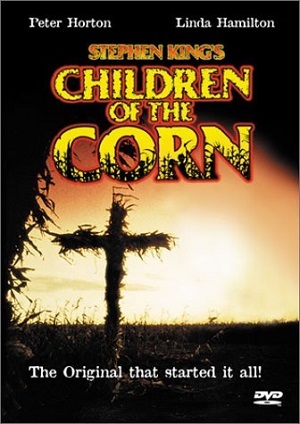 So, for those of you who have yet to check this flick out, Children Of The Corn is about a road tripping couple – one of which is a pre-Terminator Linda Hamilton – who break down in a remote rural Nebraska town (yeah, that’s the kind of pub we need, thanks) where the kids have offed all the adults, and take their orders from Amish Damien and worship “he who walks between the rows.” The movie plods along, as we experience acting that is barely B-level grade and a story that’s drawn out with little actual scares or barely an atmosphere, until you get to the big climactic ending, which by then falls a bit flat, and you’re just glad it’s over so you can go on with whatever you call a life. Ugh. Children Of The Corn was just slow, dull and rather pointless really. The children in here aren’t even that creepy, which works against the whole nature of the movie’s premise. By the time I got to the end credits, I couldn’t shut off this movie fast enough. I remember watching it back in the summer of 1989, what I like to call my misspent youth…but I couldn’t for the life of me remember anything about it, save for it not looking anything like a small Nebraska town. And I know my small Nebraska towns, here. After rewatching it for the sake of getting a review on it, I can’t say that it’s better this time around. Should have just re-read the short story instead. Final verdict of the movie is a solid “meh”. It’s been a while since I’ve sat through something that is so slow, tedious and dull that it makes the 82 minute run time seem like three hours. But, thanks to the 2010 Irish thriller (?) Shackled, I have once again experienced that sensation. Forgot how that felt, actually. Usually I can get something positive and enjoyable out of even the most low of low-budget flicks. Here, everything is so void of a personality, I found it rather hard to pay attention without wanting to break out the Solitaire game on my computer. And it’s not just that the pacing was slow, the characters were just dull, the acting was flat, and the story itself was rather hard to follow. I mean, look at the description up there. I read that, and wonder if whoever wrote that watched the same movie I did. All I got out of it was a bunch of running around, stock incidental music and probably the worst flashback scene to the 1960s I’ve ever seen in my life. The low production and dodgy sound qualities are almost a secondary thing, here. Really, if Shackled hadn’t been included on this 20 Movie Pack that I’m working through, I wouldn’t have even given it a second glance. And then I would have been happy. Yeergggh, my life has been wasted. Pass.